There is something deadening about Bax’s Knighthood; not to mention the fact that he was also appointed Master of the King’s Musick. It all reeks of the Establishment yet Bax’s sympathies were quite other. What do we expect from such a composer: acres of choral music, oratorios, marches, pomp and circumstance? The fact that six of his seven symphonies, in fact the best of his music, were written before he accepted his Knighthood in 1937, should reassure us. Here is a composer whose musical world celebrates the high summer of youth and beauty and mixes with it a razor-keen sense of their passing. Darker, violent moods also storm through the music. Irish Celtic legend, Northern sagas, woodland idylls and the world of faerie weave in and out. There is none of the hackneyed pastoral element which many people, often unfairly, associate with British music. Bax was essentially a non-conformist figure liberated from society’s conventions by the accident of his birth into an affluent family. He did not have to work or teach to survive. After his teenage years he seems never to have had a conventional home, moving from hotel to hotel and finally living out his last years at the White Horse pub in Storrington in Sussex. He spent much time in the Gaelic far West: at Glencolumcille in Ireland and Morar in Scotland. He was a very fine pianist though not a conductor. Having learnt Irish Gaelic he wrote in the language and his two children were named Dermot and Maeve. He began his regular visits to Ireland while at the Academy. 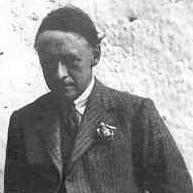 He wrote and published various poems one of which, hymning the martyrs of the Easter Uprising in Ireland, was banned by the British authorities. His poetry is passionate and vivid to this day. As an author he wrote various articles and short stories under the pseudonym “Dermot O’Byrne”. The first volume of an episodic but colourful autobiography was significantly called Farewell My Youth. Sadly there were to be no later volumes. Bax was born of wealthy parents in Streatham, London, on 8 November 1883. Their move to the house, Ivybank in Streatham in 1893 coincided with his father beginning to take him to August Manns’ Crystal Palace concerts. By 1896 Bax had begun to compose profusely. This compulsion continued to burn on a very high and oxygen-rich flame until the mid-1930s. He went to the Royal Academy of Music in September 1900. There he studied with Frederick Corder whose son Paul – another composer, became a firm friend of Bax and who wrote an orchestral piece Morar and a Violin Concerto. It was during these years that he discovered the early poetry of W.B. Yeats which, as late as 1949, he declared “meant more to me than all the music of the centuries.” Visits to Dresden with Paul Corder gave an opportunity to hear the music of Richard Strauss: Salome and Rosenkavalier. However the dominant influence of those years was Irish legend, particularly Deirdre. Although an opera was projected, this came to nothing, leaving only a cycle of Irish tone poems: Eire (Into the Twilight, In the Faery Hills and Rosc Catha). A romantic visit to Russia in 1910 and the pervasive exotic influence of Diaghilev’s Ballets Russes also left their mark. His short-lived marriage to Elsita Sobrino evaporated at the first appearance of the pianist Harriet Cohen for whom he wrote many pieces. In later years she seems to have had an occasionally stultifying effect on the promotion of his music. At the same time, when their affair was at its height, it also gave birth to his best known work, the orchestral tone poem Tintagel still heard to finest advantage on Goossens’ pioneering 78s recording dating from the 1920s. This score and performance melds the magic of the North Coast of Cornwall, the gale-tossed glittering Atlantic, the Tristan legend and passion of the two lovers in music of sweeping drive and urgency. Although Tintagel is his best-known piece many other works deserve even greater exposure and are finer. Restricting ourselves to the tone poems The Garden of Fand and November Woods are notable. The latter is amongst his strongest works. It has magic without being specifically Irish and a storm-swept fury which is quite overpowering. Fand too is a magical piece, returning to the sea-spirit of Irish legend. The numbered symphonies, of which there are seven, span the high summer of his creativity. No. 1 is turbulent and dark with occasional echoes of Holst. Bax ambiguously dismissed suggestions that it was inspired by the Great War. No. 2 is amongst Bax’s great works, mixing music of breathtaking beauty with molten savagery. No. 3, which has been his most played symphony is more pictorial in nature. Its moods are not as extreme as its predecessors. Only in its epilogue, which is restrained and contemplative, does the work become compelling. It has something in common with Bantock’s Pagan Symphony from about the same time. No. 4 conjures up bright seascapes and idyllic sunlit headlands. There is no violence here only a breezy, sunlit beauty. No. 5 represents a major change of gear and mood. This is a different Bax. Here he catches the Northern atmosphere with a Sibelian accent. Everything is more Nordic, frenzied, snowy and cold. There is no dreamy epilogue this time. Instead there is a barbaric splendour and white landscapes. This has much in common with the three Northern Ballads and his masterpiece for piano and orchestra: Winter Legends. The Sixth is the pinnacle of the symphonies. Here the wildness and Northern ferocity of the proceedings are conjured up with brutality. The first movement launches with an overpowering muscular bass figure rising to an almost shouted climax. The second movement has great beauty but is never quite carefree. The last movement opens almost humorously but the mood rapidly changes. There is a towering culmination which subsides into a perfectly judged epilogue where carolling, quiet trumpet fanfares and woodwind figures intermingle with the harp and violas in an enchanted farewell to the world. There is nothing else to be said; only a fulfilled exhaustion and a steady peaceful journey into night. Applause would seem out of place in the face of this stillness. The quality of the Sixth places it alongside Walton’s First Symphony and Vaughan Williams’ Fourth and Sixth. It is inexplicable that it is not played at least as often as these works. Where some of Bax’s works can be accused of prolixity and a lack of concentration, No. 6 is a model of emotional concentration. What it has to say it says economically and inevitably. Its time will certainly come. The Seventh is picturesque and occasionally ceremonial but catches the sense of peaceful farewell in its extremely beautiful epilogue. The Atlantic seascape is dappled with a late bright sun dipping into sunset and the seagull’s cry calls out across the years … fading and fading. Bax orchestrated most of the symphonies during his annual wintering with his lover Mary Gleaves at Morar. After No. 7 the only work of remarkable consequence was the Violin Concerto, originally written for Heifetz but finally taken up by Eda Kersey. He died on 3 October 1953 at Cork in his beloved Ireland. Amongst his last experiences was a visit to the Old Head of Kinsale. He was there for a most magnificent sunset, by all accounts lost in its glory, his companion had to take Bax by the arm and lead him back to the car. Perhaps it called up the vivid memories of another sunset seen by him in 1889 from the top of Arundel Park in Worthing and recalled as “an unimaginable glory of flame … sheer all-conquering splendour and majesty.” The promotion of Bax after the decline following his death in 1953 began in earnest with the BBC’s cycle of all seven symphonies bringing the then ailing Eugene Goossens back into the studio to conduct the volcanic Second Symphony. This cycle was widely taped using the novel wonder of the domestic tape recorder. These tapes changed hands amongst enthusiasts and offered the kindling for a revival. Concert promoters, conductors and broadcasting organisations were caught up in the atonal revolution. Bax’s music did not fit and suffered appallingly. In the mid-1960s recordings of piano music performed by Frank Merrick and Iris Loveridge (Lyrita) gave Bax a growing prominence. Revolution Recordings recorded on LP his Symphony No. 4, Symphonic Variations and Tale the Pine Trees Knew. The orchestra was the Guildford Philharmonic and the conductor, Vernon Handley. In the late 1960s Lyrita recorded Boult in Bax tone poems (including a shattering and still not excelled November Woods), Norman Del Mar in an unmatched Symphony No. 6 and Myer Fredman in the Symphonies 1 and 2. The latter two recordings were financed by Ken Russell who made a television film about the composer. In the early to mid-1970s Lyrita pressed ahead with LPs of Symphonies 5 and 7 in excellent performances conducted by Raymond Leppard. This was something of a shock as Leppard was seen as a baroque specialist. I’d love to know if Leppard got to do any Bax while with the Indianapolis SO and even more to hear some tapes. Leppard followed up the Lyritas with radio broadcasts of the Symphony No. 5, the Violin Concerto (in a much under-rated white hot performance by Dennis Simons) and in 1979 one of Bax’s towering masterworks: Winter Legends for piano and orchestra (with John McCabe). McCabe repeated the work with Handley a few years later. Chandos, a then fledgling record company, took up Bax’s cause using the Ulster Orchestra and the conductor Bryden Thomson. They first launched a recording of his tone poems. This was one of the earliest compact discs and was quickly followed by the same company and artists in Symphony No. 4. Chandos have done more than any other company for Bax’s cause. The 1983 centenary was marked handsomely by the BBC with revivals of many orchestral works including some premieres. All Baxians owe a great debt to the BBC and the inspiring force behind the generous concert series: Lewis Foreman. From the mid-1980s for the next decade Chandos completed the symphonic cycle with Thomson and delved deep into Bax’s many other orchestral and chamber works. The continuing and growing success of Bax’s music coincided with the digital and CD ‘revolution’ and found an audience sated with multiple cycles of Beethoven and personality conductors. This same audience, adventurous and ready to explore, continues to push back the boundaries of known music well beyond the ‘safe’ and steady repertoire of the ‘great’ orchestras and conductors playing ‘great’ music. Bax may well be one of a host of composers whose music will make more headway in commercial and radio recordings and as the technology opens up, over the Internet, than it will be allowed to in the concert-hall. Sad though this might be, anyone who feels anything for the music of Bax will welcome the fact that it seems to be finding new adherents and enthusiasts all the time. Parallels with other composers are not always helpful however some lines of comparison and contrast may be revealing. Some of the music may remind us of the hedonistic side of Delius. Occasionally he does sound like Delius (Summer Music, Romantic Overture and The Happy Forest ). Bax however conveys a greater sense of drama and urgency. His symphonies are not pastoral idylls and there is a chillier violence and a more intense beauty than the more chaste accents of the impressive VW symphonies. The faery music element could easily be off-putting but those who listen will immediately realise that there is nothing fake-fey about this material: if there are faerie people in the music they are not the tame domestic fairies at the bottom of the garden but more dangerous, unpredictable, sensual and libidinous creatures. They have more in common with Balakirev’s Tamara than with Disney or Enid Blyton. His music occasionally smacks of Rimsky-Korsakov (there’s one passage in Symphony No. 3 with a brief but unmistakable echo of Russian Easter Festival Overture). Sibelius can be heard too but there is no plagiarism. The occasional and isolated use of the Finnish composer’s musical idiom provides an ideal vehicle to convey a world that is Bax’s alone. Dukas’ Poème Dansé - La Péri could easily be mistaken for Bax. The sound-world comparison is uncanny. There are similarities with certain passages in the music of Janis Ivanovs and Eduard Tubin. The influences can be felt far and wide and are not to be taken as critical either of Bax or the other composers mentioned. E.J. Moeran’s music is less involved. Its clearer textures occasionally veer into Bax territory especially in the Symphony and Violin Concerto. Another brother-in-sound is the music of the American, Edward Burlinghame Hill – listen to his Prelude for Orchestra on the old Columbia/Bernstein LP. Philip Sainton’s tone poem for orchestra The Island pays Bax a pretty direct compliment as well as being most impressive. It fully matches up to Bax’s best. Occasional echoes of Bax (and Moeran) can be heard in the music of Patrick Hadley. Hadley’s Symphonic Ballad - The Trees So High is a fine, meltingly emotional piece perhaps nearer to Moeran than to Bax. Conveniently both the Sainton and the Hadley are on the same Chandos CD CHAN 9181. John Foulds’ also has his Baxian moments. Do try out two magnificent CDs from Warner and Lyrita (SRCD 211 and 212) especially the Dynamic Triptych for piano and orchestra and two orchestral pieces: Three Mantras and April-England. Arthur Benjamin’s one and only Symphony (a Barbirolli favourite) is a Baxian canvas which I cannot recommend too highly. It has been recorded by Lyrita conducted by Barry Wordsworth. It is not a Bax copy: impressive, quite distinctive, violent, stormy and with quite a few hints of Prokofiev, Walton and even Roy Harris. Benjamin has a foot in both Bax and Delius camps in his marvellous Romantic Fantasy for violin, viola and orchestra which is dedicated to Bax. Eugene Goossens’ two symphonies also have much in common though the language is slightly more astringent. If only Unicorn would reissue the Symphony No. 1 (David Measham) which they issued on LP in the 1970s. Lastly you should also try the orchestral music of Joseph Holbrooke: try Dutton, CPO and Marco Polo. His Ulalume tone poem fully deserves to stand beside the best of the Bax tone poems. Bernard Herrmann’s Symphony has Baxian resonances. Try it on either Unicorn-Kanchana conducted by the composer (UKCD2063) or a newer recording from James Sedares conducting the Phoenix SO on Koch International Classics 3-7135-2H1. Bax was extremely prolific. There is no room to mention everything. One thing though which becomes apparent after listening to Bax’s music is that his voice is distinctive. The accent may have changed as the years went by but a Bax score is as recognisable as one by Sibelius, Shostakovich, VW, Walton or Moeran. If by any chance all the purple prose, talk about legends and faerie folk puts you off – just forget the literary effusions and listen to the music. It stands alone, needing no literary props. The only requirement is to listen and be willing to enter a world which has the rarest qualities of enchantment, beauty and strength. © Rob Barnett, 88 Barrows Green Lane, WIDNES WA8 3JJ, United Kingdom, 0151 423 3783 In addition to my own experience of Bax’s music I have drawn heavily on the following books. The errors are my own. I owe an enormous debt of gratitude to many people in widening my knowledge of the music. Above all though special thanks must go to Graham Parlett. (R.B.) BOOK LIST (select) Bax – A Composer and His Times, by Lewis Foreman, Scolar Press, 1983 and two subsequent editions. Music examples. Full biography. Full list of works. The authoritative biography. Hardback Farewell, My Youth and other writings by Arnold Bax, ed. Lewis Foreman, Scolar Press, 1987. Bax’s autobiography covering the years of childhood and youth up to circa 1916. Many of Bax’s other writing are also included. 183pp. Hardback. Circa 100 illustrations. Bax, by Colin Scott-Sutherland, Dent, 1972. (out of print) Bax, by Christopher Whelen. A chapter (pp25-34) in Vol. 3 of “The Music Masters”, Cassell, 1954. Long out of print but definitely worth borrowing or looking out for in second-hand bookshops.